385 Marlborough is located on the north side of Marlborough, between Hereford and Massachusetts Avenue, with 383 Marlborough to the east and 387 Marlborough to the west. 385 Marlborough was designed by architect Obed F. Smith and built in 1880-1881 by Vinal & Dodge, masons, and G. & E. Stewart, carpenters, for building contractor George Wheatland, Jr., for speculative sale. It was one of six contiguous houses (381-383-385-387-389-391 Marlborough) built at the same time and one of twelve contiguous houses (369-371-373-375-377-379-381-383-385-387-389-391 Marlborough) built for George Wheatland, Jr., in 1879-1881. He is shown as the owner of 381-391 Marlborough on the original building permit application for the six houses, dated November 11, 1880 (one application for six houses). Click here for an index to the deeds for 385 Marlborough, and click here for further information on the land on the north side of Marlborough between Hereford and Massachusetts Avenue. On April 11, 1882, 385 Marlborough was purchased from George Wheatland, Sr., by Mary L. (Payson) Mulliken, the widow of Samuel Mulliken. Living with her were her unmarried daughters, Sarah Payson Mulliken and Julia Frances Mulliken, her daughter, Mary E. Clark, the widow of Dr. Joseph James Clark, and the Clarks’ children: Joseph Payson Clark, Herbert Clark, Mary Oliver Clark, and Frank Mulliken Clark. They all previously had lived at 10 Hawthorne Street. The same day she purchased the house, Mary Mulliken transferred it to her daughter, Mary Clark. The deed was not recorded, however, until March 28, 1886, after Mary Mulliken’s death. Sarah Mulliken and Julia Mulliken continued to live at 385 Marlborough during the 1883-1884 winter season, but moved thereafter. Mary (Payson) Mulliken died in March of 1886. Mary Clark and her children continued to live at 385 Marlborough. Joseph Payson Clark, a physician, moved to 76 Marlborough in about 1895. Mary Clark died in January of 1913 and 385 Marlborough was inherited by her four children. Herbert Clark, a real estate dealer, Frank M. Clark, a bank clerk, and Mary O. Clark continued to live at 385 Marlborough. Frank Clark married in November of 1914 to Bertha Mayer Hamilton and they moved to an apartment at 373 Commonwealth. In about 1917, Herbert Clark moved to 71 Marlborough to live with his brother, Joseph Payson Clark. Mary O. Clark went to France in January of 1917 to work in the relief effort during World War I. 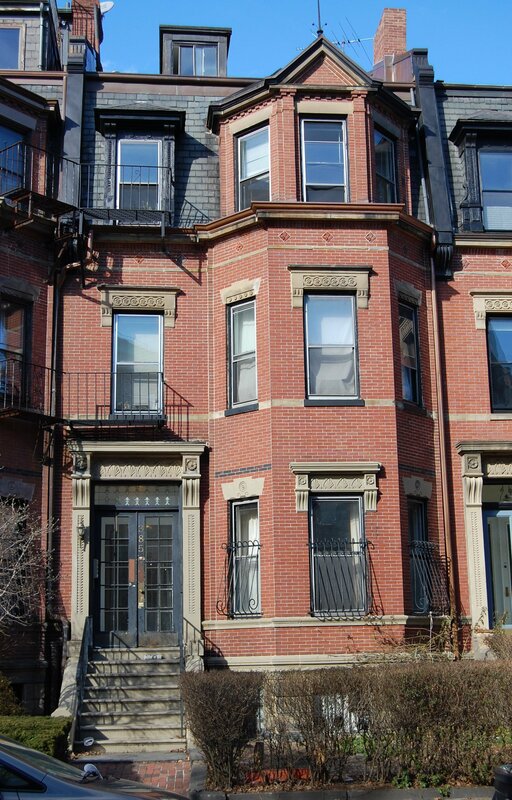 The Clark family continued to own 385 Marlborough and lease it to others. By the 1916-1917 winter season, 385 Marlborough was the home of mining company executive Richard Fay Parker and his wife, Emma Rosalie (Guild) Parker. They previously had lived at 193 Beacon. They continued to live at 385 Marlborough during the 1917-1918 season, but moved thereafter and by 1920 were living at The Puritan at 390 Commonwealth. 385 Marlborough was not listed in the 1919 and 1920 Blue Books. In January of 1920, at the time of the 1920 US Census, 385 Marlborough was the home of Miss Katherine (Kate) Irving Sanford. She also maintained a home in Taunton. By 1921, she had moved to 130 Marlborough. During the 1920-1921 winter season, 385 Marlborough was the home of Homer Eugene Sawyer, Jr., a paper mill executive, and his wife Kathryn (Motley) Sawyer. They previously had lived at 304 Marlborough. They moved from 385 Marlborough by the 1921-1922 season and were living in Dedham by 1923. During the 1921-1922 winter season, 385 Marlborough was the home of Cleveland Bigelow, a cotton merchant, and his wife Frances Constance (Folsom) Bigelow. They previously had lived at 10 Gloucester. They also maintained a home in Cohasset. On July 28, 1922, 385 Marlborough was purchased from Joseph, Herbert, Mary, and Frank Clark by Frank Alphonsus McDonald, an undertaker. He and his wife, Nellie A. (Denneny) McDonald, lived at 11 Belvidere. On July 39, 1922, 385 Marlborough was acquired from Frank McDonald by his sister, Clare Alberta (McDonald) Supple, the wife of Dr. Edward A. Supple. He was a physician and also maintained his office at the house. They previously had lived (and he had maintained his office) at 409 Marlborough. They continued to live at 385 Marlborough until his death in February of 1939. Clare Supple and their five children (Clare, Edward, David, Philip, and Lawrence) moved soon thereafter to Newton. 385 Marlborough was shown as vacant in the 1940-1942 City Directories. On January 24, 1940, the Union Savings Bank foreclosed on the mortgage it held on 385 Marlborough and took possession of the property. On April 13, 1942, 385 Marlborough was purchased from the bank by Margaret M. (DeBeukelaer) Izzicupo , the wife of Donato Izzicupo, an interior decorator. They previously had lived at 53 East Springfield. In July of 1942, Margaret Izzicupo filed for (and subsequently received) permission to convert the property from a single-family dwelling into three apartments. The Izzicupos lived in one of the apartments until his death in May of 1945. On October 5, 1945, 385 Marlborough was purchased from Margaret Izzicupo by Charles Harvey Edwards, an engineer, and his wife, Hannah (Marx) Edwards. They previously had lived in Michigan. They lived in one of the apartments until about 1949, but moved thereafter. On July 15, 1949, 385 Marlborough was acquired from the Edwardses by John Watkins Dineen and his wife, Rose C. (Ulrich) Dineen. They previously had lived in New Hampshire. They lived in one of the apartments until about 1953, but moved thereafter. On August 20, 1953, 385 Marlborough was acquired from the Dineens by Rose Rochelle (Goldberg) Levin Glazer, the former wife of Reuben Levin and of Max L. Glazer, who lived at 273 Beacon. She was a pianist and entertainer who performed as (and legally changed her name to) Rose Rochelle. She owned several apartment buildings and lodging houses in the Back Bay and South End. On November 4, 1960, she transferred 385 Marlborough and several other properties to herself as trustee of the Rochelle Realty Trust. On December 31, 1963, 385 Marlborough was purchased by John Francis Kane, an accountant and real estate developer. He was unmarried and lived in one of the apartments. John Kane died in May of 1989. In his will, he left the bulk of his estate to his friend, Jon J. Feeney, whom he also named as his executor. On December 13, 1994, Jon J. Feeney transferred 385 Marlborough to himself and Patricia Apeland as tenants in common. On November 3, 2007, they transferred the property into Jon Feeney’s name, and on December 3, 2007, he transferred the property to himself as trustee of The 385 Marlborough Street Nominee Trust. 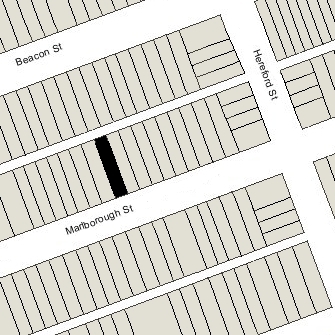 In August of 2009, Paul Schlegel, successor trustee of The 385 Marlborough Street Nominee Trust, filed for (and subsequently received) permission to convert the property from three apartments to four apartments, indicating that this had been the existing condition “since the 1940s” (based on City Directory entries, it appears that the property had been occupied by four families since the mid-1950s). The property subsequently changed hands. It remained an apartment building, assessed as a four- to six-family dwelling, in 2017.